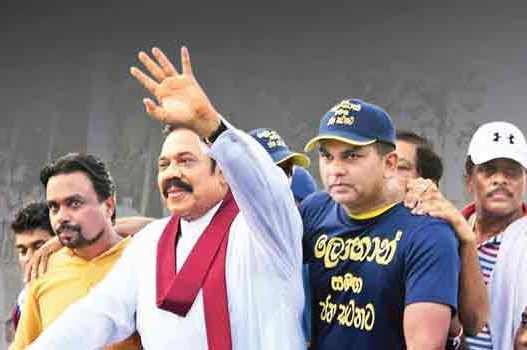 Jana Satana Pada Yathra organized by Joint Opposition will arrive in Colombo today with no specific place to hold its final rally. Ratnapura District Parliamentarian Ranjith de Soyza said they will hold the rally in a place that would surprise and send shockwaves through the government. Meanwhile, United People's Freedom Alliance (UPFA) parliamentarian and member of the Joint Opposition Vasudeva Nanayakkara said the Pada Yathra procession will converge at a public space as Hyde Park has been denied. However, the final destination for the Joint Opposition flock has not yet been determined, he said.The Pada Yathra will conclude with a rally in Colombo today, where the Joint Opposition supporters will be addressed by the key members of the Joint Opposition. According to Nanayakkara, he had applied for the use of Hyde Park two weeks prior to the event and had adhered to the standard procedure, nonetheless, access to Hyde Park was denied to the joint Opposition congregation. Speaking to Ceylon Today, he said, yesterday; "I applied for the use of Hyde Park on the 15 July, and I received a permit dated 21 July allowing us to hold a meeting there. Then I applied to the Police to use loud speakers as well, but then, the Police having delayed in the matter, sent me letter dated 29 July that the Police permit cannot be given because the permit for the ground has been cancelled, was the reason given in the letter by the Police. The Commissioner's letter stated that the grounds were under repairs for development. We have not yet decided where to go to, when the Pada Yathra reaches Colombo. We can go anywhere the public has access to. It's the general public after all. The public can go anywhere to any grounds where they have access to. At a media conference yesterday, Minister for Sports Dayasiri Jayasekera claimed that Nanayakkara had not followed the standard procedure in requesting the use for the grounds. In response to this claim Nanayakkara noted; "I have all the letters of the transaction with me. I don't have to disclose to anybody about holding a public meeting, which we applied for requesting as a registered political party who is taking part in the Pada Yathra. The failure of the Joint Opposition (JO) to find a ground for the Protest March, Pada Yathra final rally cannot be palmed into the hands of the government. Referring to the accusations of the Joint Opposition (JO) as a trap concocted by the government, "The organizers of the protest march are responsible for the crisis of the Paada Yathra final rally becoming 'groundless'" Minister for Sport, Dayasiri Jayasekara said. Addressing a media briefing yesterday (31), he commented that last 15 (Friday) Vasudewa Nanayakkara requested permission, scribbled on a half sheet, mentioning the reason as 'a private matter'. "However, the Colombo Municipal Council had already made the decision that now is the best period to repair the ground in the dry weather" he said. Likewise, the Municipal Council decided to continue with the repairs and not to make it available for any gathering, although it was requested by a Student Union and the United National Party (UNP) as well. Commissioner of the Colombo Municipality V. K. A. Anura told Ceylon Today that he has not yet received any request to reserve any ground or other place in the Colombo Municipality area to hold the meeting of the Jana Satana Pada Yathra. Although Member of Parliament Leader of the Democratic Left Front Vasudeva Nanayakkara has made a request under the name of his party that the Hyde Park Grounds be reserved to hold a meeting on 1st August and there is no mention at all of the Pada Yathra but money has been paid on behalf of the reservation, the Municipal Commissioner said. He also said that it had been planned earlier to renovate the grounds and work had already commenced, but Municipal Commissioner Anura said that since the renovation work could not be completed in time, they are unable to provide this ground on that day.